Don't mock my (spaghetti) balls! Who is your Pasta pastor? The FSM, Reformed FSM and rwenzori's tomato church could perhaps form an ecumenical society where the wives anoint their hubbies with spaghetti bolognese. Great plan! Rwenzori's Discount Cheep-Cheep Pasta Emporium will offer special deals on said spaghetti. BTW is "ecumenical" a type of cheese? Actually it is a type of antipasta made from the holes in the macaroni. It pops into and out of existence like no-stamp collections and is popular with spirits. Tweefo, I love that image you have used as your avatar. Awesome. The "Hand Of God", teehee. Or maybe the hand of the big blue guy from Watchmen. No but seriously, I am so grateful to be alive at a time when we are able to explore the universe like this, and be able to know just how immense and beautiful it is. Hooray for the Hubble Space Telescope, I can't wait for the new space telescope to come online. Go science! 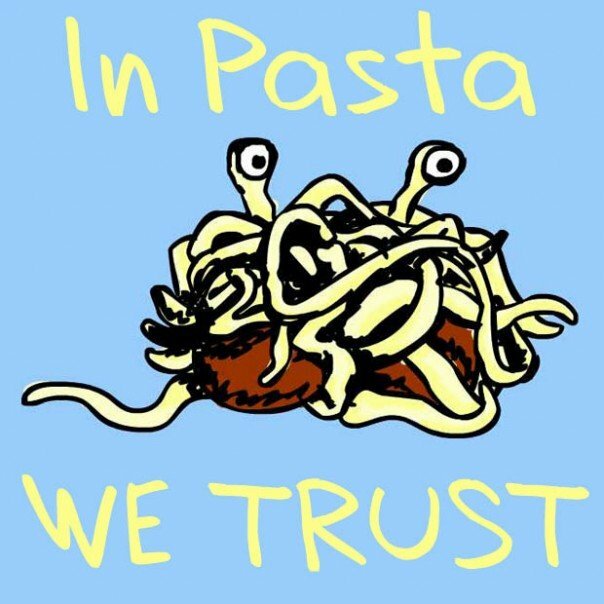 Sorry to derail this very serious thread, please feel free to return to discussion of our glorious FSM, and his beneficent manifestation in the form of pasta and antipasta. ...and his beneficent manifestation in the form of pasta and antipasta. Most of which presumably annihilated each other shortly after the Big Bang. The Big Cook-Up, actually. Teach the controversy! It's not Hubble but a infrared image by the Chandra observatory. Hooray for the Chandra observatory!